Our Price: $1.75 12% off! Treat yourself to a Texas size pecan praline! We believe we have discovered the best pecan pralines on planet earth...and they're made right down the road from the Southern Star Pecan Orchard. Jeanne's Fancy Pralines are a large three inch chewy pecan candy topped with fresh pecans. You will be hooked on this delightful treat with the first bite. 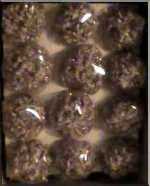 Texas Size Pecan Pralines - One Dozen - $24.95 including shipping.